For some odd reason, once it gets up to opperating temp, it kinda runs warmer than it should, but once the fan kicks on the temp goes down...but heres the weird part...after its been runnin for about 15 min or so it the engine shuts off!!! Im thinking its either fule or ignition. (keep in mind i just replaced the distributor) What the heck is going on? Ignition module? Re: 95 g.t 5.0 help!!! Sounds like a fuel pump issue to me. When the car wont start can you hear the fuel pump prime when you turn the key forward? 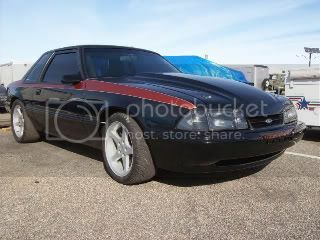 92' LX-Big brakes, Lots and lots of suspension, GT40X heads, Ported cobra intake, stock cam, Vortech SC trim. Yeah, i can hear it prime, but im not too familiar with them, i only know the sound that it makes when i turn the key...do you think it still could be the fuel pump not opperating correctly? check the igntion coil, my mustang would shut off while driving. I let it sit overnight and it started the next morning. I drove it around all day fine, started up fine. That evening it shut off again while driving. Upon investigation my ignition coil was bad. 20 bucks and 15 minutes of work and Ive never had the problem again. There is a temperature sensor above the thermostat that can go bad and might give the computer the do not start signal. My Chilton repair manual (an o.k. reference book) has a test procedure for it. If you hear the fuel pump running it should be alright. Are you still having issues with the car shutting off? There is a grey colored TFI module on the passenger side frame rail near the shock tower. When this module goes bad, it will often have similar behavior when it gets hot. Another issue to check is the distributors PIP module.